(TibetanReview.net, Nov19, 2017) – A strong earthquake has jolted a remote, sparsely populated area in Nyingtri (Chinese: Nyingchi) City of Tibet Autonomous Region in the early hours of Nov 18. Three people sustained minor injuries and the quake also caused power failure and cracks in houses in a number of localities in the City, reported China’s official Xinhua news agency Nov 18, citing the regional seismological bureau. It was a 6.9-magnitude earthquake which occurred at 6:34 am Beijing Time, said a previous Xinhua report 18, citing the China Earthquake Networks Center (CENC). However, the US Geological Survey has put the quakes magnitude at 6.3. The epicentre was reported to be at 29.75 degrees north latitude and 95.02 degrees east longitude. The quake’s depth was reported to be a shallow one of about 10 km. Several minor aftershocks were reported to have been felt, including a 5-magnitude earthquake at 8:31 am. Xinhua said the quake caused power failure and building damages in a number of villages in the epicentre. It cited Basang Cering, Party chief in Zhaxigang Village of Lunang Township as saying he could not stand still in his house when the quake struck and that six houses in his village had been damaged. 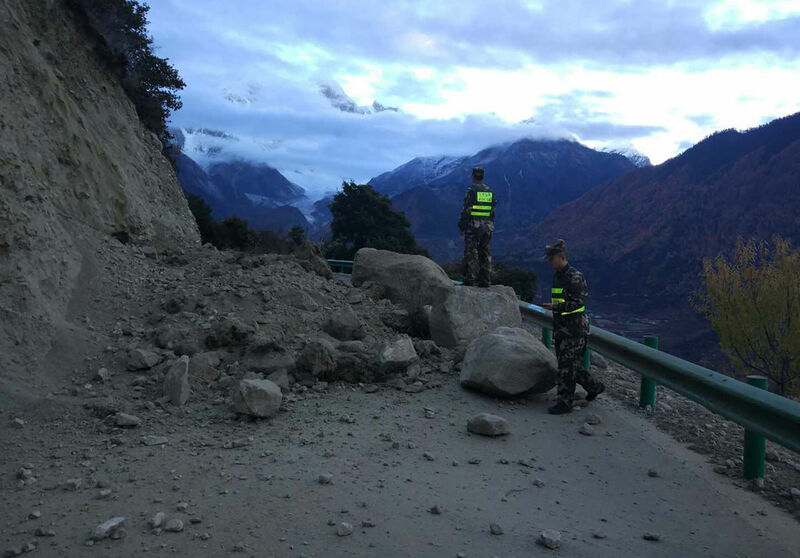 The tremor was also reported to have triggered falling rocks, which blocked a highway linking Nyingchi city proper with Tangmai, one of the quake-hit townships. One team of rescuers was to take a helicopter to Gyalha village in the epicenter since the road to the village was blocked by rocks, the report added. Xinhuanet.com also showed a photo, said to be of rescuers, checking a blocked road in Paizhen Town of Mainling County. The USGS has said the epicentre was located 185 km away from Along, 200 km away from Pasighat, 244 km away from Tezu and 330 km away from Itanagar, all cities in India’s border state of Arunachal Pradesh. The tremor was reported to have been felt strongly in Itanagar, the capital of Arunachal Pradesh, as well as in other towns like Aalo, Anini, Tuting, Gelling, Yingkiong and Mechuka.